How difficult is the trekking, how many hours will I need to walk? You decide together with the guide how you want to spend your trek, our guides are skilled at customising adventures for you (and your children’s) capacity and wish. We do both easy and difficult treks around Sapa. An normal trek is about 12-15km/day and you walk for about 5-6 hours. You can book your trek through on online, or by filling in our contact form, or by email sapasisters@gmail.com. You can also book directly at our office at Graceful Hotel, 9 Fansipan Street, Sapa. No, we only do private tours. How do I pay for my trek? You can either book and pay for your trek through our online booking page or if you have booked your trek by email, you can choose to pay in cash, directly to your guide when you meet her. We can not accept credit crads, only cash. We prefer payment in VN Dong but US Dollar is also fine. If you book a tour to any of the markets you will have to pay your tour in advance by credit card online. To read our terms and condition for advance payment click here. Do you have a office in Sapa? Yes, we just moved the office to 11 Fansipan Street, Sapa. For late bookings, if you are already in Sapa, you can book your trek directly in our office. Here you can shower, have breakfast and easier snacks and beverages in our restaurant, store your luggage while trekking, buy train tickets, book private cars around the area, to Hanoi or Ha Long Bay, book shared minivan or private car to Lao Cai train station and more. Welcome in! The price depends on how many days you want to trek, who many people there are in your group and what you want to do. You find our current price list for the “normal” treks on the Book online page or fill in our contact form and we will get back to you with our prices. Lunch is included in all our treks. If you choose a trek with homestay you will also have breakfast and dinner at the homestay. Dinners are a mix of traditional food with lot’s of vegetables, pork, rice and tofu. If you are vegetarian simply inform our guides ahead of time and they will be happy to purchase food that fits your dietary needs. If you want to have lunch at a local house instead of in a restaurant we can arrange that for an additional fee. Then either your guide or the family cook your lunch. If your guide cook for you-you can buy the groceries together on the way. You are also welcome to take part in the cooking if you want to learn how to make Hmong food. Some guides bring their guests to their family members house or to their own house. Homestays are a type of inn which is normally run by local families down in the valley. When you choose to stay the night at a homestay you wake up already in the valley, which enables you to explore more of the scenery. The guests shear one big loft our room, on the second floor in a beautiful traditional house. The host and their family stay in a separate part of the house. There are no private bedrooms in the homestays. There are hot showers, western standard toilets, beds and tasty traditional food. The homestays are clean and safe. In March 2018 we opened our own homestay, Zao’s House. It’s located soon passed Ta Van village, a bit up the mountain and with a fantastic view over the valley. Zao’s House is co-owned and run by Zao and her family. Zao’s husband, Ze, cooks the best traditional H’Mong food and you are welcome to join him in the kitchen. The homestay has 2 private rooms for 1-3 people to share and beds for 13 guests. Our homestay is welcoming and nicely decorated, it has a higher standard than traditional homestay in the area, free Wi-Fi, real beds (always clean bed sheets), cleaning water filter for all running water so you can have a fresh shower. Towel/shampoo/slippers are provided. If you want to stay in one of the private rooms an extra charge will be added to the trek. You can also rent the private rooms for a couple of days if you want to hang around in Sapa valley a bit longer. Some of our guides welcomes guests to their house. They all have beds, electricity and good food but they don’t have shower or western style toilet, some have very simple toilets. This option is only available for small groups with 1-4 travellers. There will be an additional fee for this option. Bring a smaller backpack with change of clothes and personal things needed for the trek. You can buy water along the way, but bring some with you if you choose to go off the main tourist trail. All homestays provide bed sheets, towels and have mosquito nets over the bed but bring mosquito repellent for the evenings. Other things to bring: sun cream, extra toilet paper, snacks for the road, flash light, warm clothes if you trek in winter, early spring or late autumn and swimsuit if you come in the sumer. Most of the time you meet your guide in Sapa, she can come to your hotel or you meets in our office. If you have booked a tour to any of the markets, with start from Lao Cai, your guide will meet you at the train station. Do you offer Herbal Bath? Yes, if you trek to Ta Phin villages you can have traditional Herbal Bath. You pay an extra fee directly to your host. You can leave your luggage for free in our office while trekking. There you can also have a shower before and after your trek. Towels are provided free of charge. Do you offer pick-up from Lao Cai to Sapa? We offer a pick-up package for travelers with Sapa Sisters, 1-way Lao Cai-Sapa, including breakfast in our restaurant for 7$/person. If you want 2-ways transportation it’s an additional 3$/person. We can also arrange pickup by private car for 30$/1-way, Lao Cai-Sapa. How do I get from the train station in Lao Cai to Sapa? Minibuses Lao Cai – Sapa leaves right outside the train station, they cost about 3-4USD. The ride takes about 50 min. We also arrange pickup and drop-off for you. Does Sapa Sisters arrange climbs to Fansipan. No, we don’t have the right permission to guide travellers to the peak of Fansipan. Does Sapa Sisters arrange hotel bookings? Yes, We have a few hotel partners in SaPa please let us know your price range and we will check avilability. •Insurance. The customer is required to have full travel insurance. •Pre and post trip accommodation. We would like to make you aware of an issue that you may encounter during your trek. The issue concerns the selling of goods by local villagers to travellers during their treks and what can be uncomfortable for some travellers. These women are often on the trails, following travellers, looking to sell their wares and can seem “pushy”. The best course of action in dealing with them is to politely but firmly decline to purchase goods – if you are not interested. It is quite difficult for our guides to ask them to leave as these women are often from the same villages or are directly related to them, and asking them to leave could (and has in the past) cause conflicts for them once they return to their village. This sellers are in no way affiliated with /employed or encouraged by Sapa Sisters. "I did 2 day and a half trek with Lan ( My little auntie Lan), it was diffiicult because the weather was horrible, but I ended feeling like : I really want to come-back ! 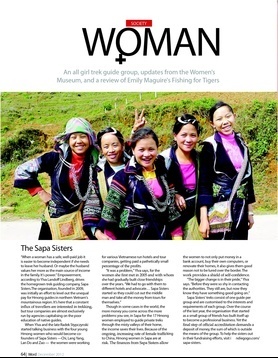 Thanks ..."
"We just came back from three beautiful tracking days with Lan from the Sapa- Sisters. You want to go tracking, experience a beautiful nature, see places you would never ever fin..."